Several scenarios for events at and following the K-T boundary have been proposed, some of them predating the one set forth in Alvarez et al. (1980), the publication that substantially renewed speculation on the subject. In this chapter we summarize the most prominent hypotheses, including that advanced by the Alvarez team. In the final section of this chapter, we discuss our own preferred scenario, which is based on our understanding of effects of the boundary event on plant life. Other reviews of K-T boundary scenarios, most of which emphasize the impact hypothesis, are presented in books by Albritton (1989), who also reviewed the whole concept of catastrophic events in Earth history and the way they have been viewed since the seventeenth century; Allaby and Lovelock (1983); Alvarez (1997); Frankel (1999); Hsu (1986); and Powell (1998). 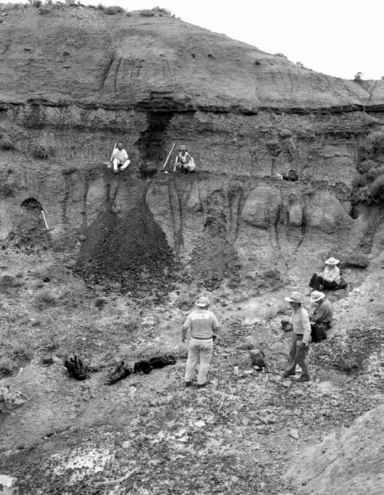 Archibald (1996) and Officer and Page (1996) proposed alternative scenarios to account for the mass extinctions at the end of the Cretaceous. In general, these books feature the history of dinosaurs and tend to neglect the fossil plant record, exceptions being Hsu (1986) and Powell (1998); some of them overlook plants entirely. This short shrift or omission from prominent books on the subject served as our inspiration for writing this book. Disregarding a few unconventional and even unscientific (in the sense of being untestable) ideas about causes of the K-T extinctions (which also focus on dinosaurs), the mainstream hypotheses center on four themes: climate change, regression of epicontinental seas, a major episode of volcanic eruptions, and impact of an extraterrestrial body. We briefly discuss and critique each of these in the following sections.